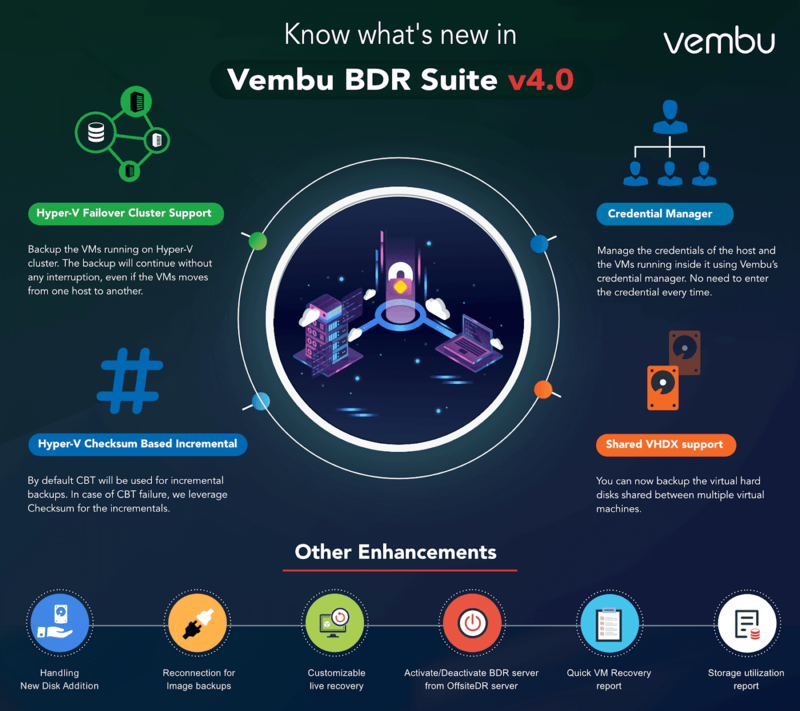 Vembu recently announced the latest release of their flagship product Vembu BDR suite v4.0 with some cool new features,so thought of dedicating an article to talk about the various enhancements being made. Hyper-V Failover Cluster Support - This release of Vembu BDR Suite now support's Backup of the VM's running on Hyper-V Cluster, which means that now the scheduled backup will not be interrupted even if the Virtual Machines are failover from one host to another host. Handling New Disk Addition - In the older versions of Vembu BDR suite any newly added disk to a Virtual Machine on ESXi and Hyper-V was backed up only during the next full backup. From v4.0, the new disk additions are designed to be detected and considered for back up on the next incremental schedule. Checksum Based Incremental for Hyper -V is leveraged ensuring seamless backups when the default CBT technology fails. Storage Utilization Report can now be generated with details like the size of VM before the backup schedule, the actual size of the backup data in the storage repository, compression , storage reduction rate. 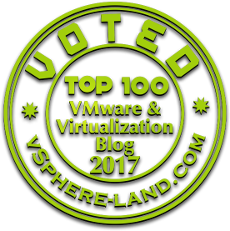 Live Recovery to VMware ESXi and Hyper-v has now been enhanced where in we can configure the hardware specifications of the target hosts including socket and core counts, memory and hard disk provision type when performing permanent recovery. All new credential Manager helps to manage the credentials of the VM hosts, guest Virtual Machines and physical computers avoiding the need of entering the credentials every time. Backup of Hyper-V Virtual Machines' was initially limited to SMB storage and now with Vembu BDR v4.0 it has been enhanced to Shared VHDX. Active replication Job's can now be aborted from within the Vembu offsite DR server console to terminate an ongoing replication from Vembu onsite to offsite server. 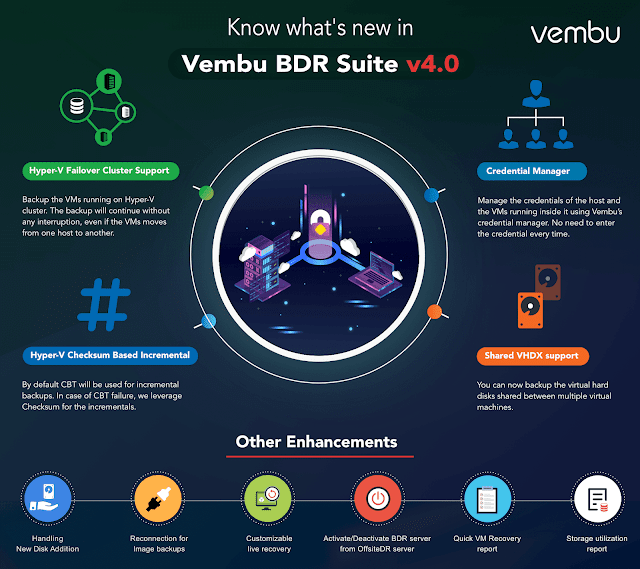 We can now activate or deactivate Vembu BDR Servers from Vembu OffsiteDR if we wish to stop the backup replication to the Disaster Recovery Site. Quick VM Recovery Report provides us with an insight into virtual machine recovery job with details like the RTO, start time and end time and also help us with the some other filters including the name of the VM being triggered for recovery and the target server. Let's Virtualize. Awesome Inc. theme. Powered by Blogger.